Fronted by former Tori Amos guitarist Steve Caton, along with former Guns 'n Roses drummer Matt Sorum, Vinnie LoRusso, Toby Skard, and Thomas Morse, Caton and company delve into melodic industrial-electronica-rock in their new project, Binge. On their debut 3-song EP, the band manages to find middle ground between hard-driving and melodic crunch. 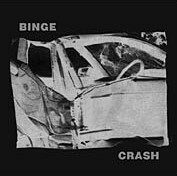 The opening track, "Crash," swirls around in your head with surreal tones and a mysterious way to it, before 'crashing' down on you with some splitting drums and sharp guitars backed up by heavy bass. "Shame (for C.R.)" hooks you with its strong melodic pop sense, while still managing to drive you with its rock appetite, and make you dance with its irresistible dance beat. And then there is "Spirit in the Flesh," a song that finds the band coming full circle with the industrial and ripping right in to the churning mayhem which fuels the band. Yet, they still manage to keep the melodic sense that brightens up the music present. After reading the bio and looking at the band's press shot, I quickly wrote them off as another metal band that was going to try to be melodic, which hardly ever works. But then I listened to the CD and found them to be so much more, and anything but metal. Industrial, dance, electronica, and melodic rock are what this band is all about, and they mix it quite well. I'll give it a C.